the Rev. 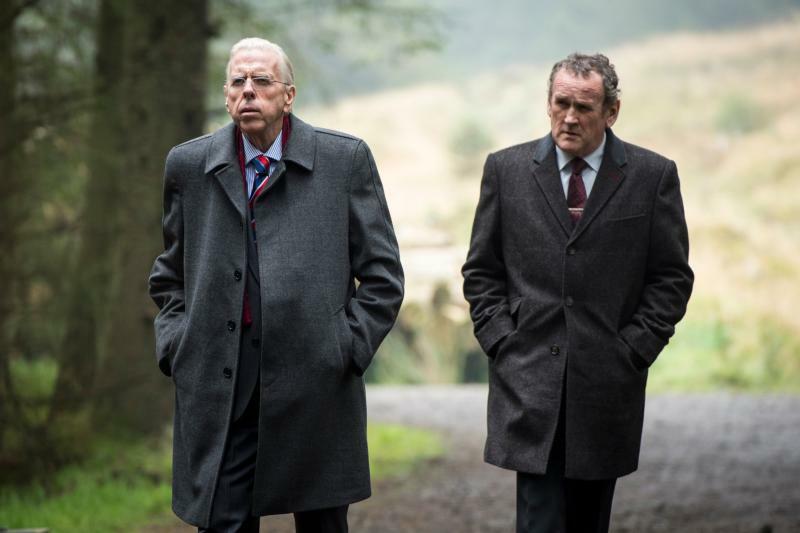 Ian Paisley (Timothy Spall) and Martin McGuinness (Colm Meaney) star in a scene from the movie “The Journey,” a fictionalized telling of how McGuinness and Rev. Paisley came to a political solution in 2006 in Northern Ireland to bring decades of Christian-on-Christian sectarian violence to a halt. (CNS photo/IFC Films) See JOURNEY-HAMM July 6, 2017. WASHINGTON (CNS) — If Martin McGuinness and the Rev. Ian Paisley can wage peace instead of war, anyone can, according to TV and movie director Nick Hamm. Like the Catholic McGuinness, long linked to Sinn Fein and the Irish Republican Army, and the Presbyterian cleric who founded the Democratic Unionist Party in Northern Ireland, Hamm is from Northern Ireland. The Protestant filmmaker, 59, said he saw enough of the “Troubles” to beat a hasty retreat to Manchester, England, and then to London when he was old enough. But he returned to Northern Ireland to film “The Journey,” a fictionalized telling of how McGuinness and Rev. Paisley came to a political solution in 2006 to bring decades of Christian-on-Christian sectarian violence to a halt. 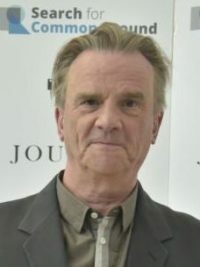 In Washington to promote “The Journey” before its July 7 U.S. premiere, Hamm told Catholic News Service it should be instructive to longtime enemies in other regions of the world that peace is possible. Hamm said some audiences found it hard to believe that “both these men were Christian” and that McGuinness and Rev. Paisley “hated each other more than any Jew could hate any Palestinian, more than any Hindu could hate a Muslim,” yet they found the way to peace. Even though the St. Andrews Agreement was brokered 11 years ago, “no one seems to be rising through the ranks” to succeed either man on needed peace initiatives around the globe. Rev. Paisley died in 2014, and McGuinness died March 21. “The Journey” premiered in Northern Ireland earlier this year and got a rapturous reception. “Everyone was there, Sinn Fein, DUP, ex-IRA. They loved it. They lived it,” Hamm told CNS. Of course, timing is everything. Now on the docket is the overture from England’s Tories, or Conservative Party members, to the Democratic Unionist Party to form a coalition government in Britain that would allow Prime Minister Theresa May’s party to remain in power. Talks regarding the British exit, or “Brexit,” from the European Union, remained in a state of suspended animation. Also a major demonstration of the summer “marching season” was nearing in Northern Ireland. Protestants parade through Catholic sections of Belfast and other cities to commemorate long-ago Protestant victories over their Catholic neighbors. The Brexit situation is stickier, because Northern Ireland voted to stay in the EU. In a worst-case scenario, a wall could be erected between Northern Ireland, which is still part of the United Kingdom, and the independent Republic of Ireland to its south. Observers say Brexit will result in passport and customs checks, and some kind of barrier along the the 310-mile border between the two countries would be needed. “The last thing anybody wants is a wall,” Hamm declared. And the political piece of it has its own idiosyncrasies. “If Sinn Fein decided to take its seats in the House of Commons, it would cancel out (British Prime Minister) Teresa May’s majority,” as the seven Sinn Fein seats would deprive the Tory-Democratic Unionist Party coalition of a governing majority, Hamm said. But Sinn Fein would never allow its elected representatives to be seated, he added, because to do so would, in their view, recognize England’s dominion over Northern Ireland, which Sinn Fein would be loath to admit. Even in “The Journey,” McGuinness (played by Colm Meaney) retorts “Allegedly!” to Rev. Paisley’s (Timothy Spall) description of him as an IRA leader. “McGuinness would never admit he was IRA,” Hamm said. Peace is a precious gift. Human beings are invited to live in peace.